Lightweight aluminum deluxe pick up tool picks up items on floors, in backs of cabinets or on high shelves. Simply squeeze the locking handle and suction-cup brackets secure until you release. This grab tool picks up items up to 5 lbs. Folds for easy storage. Reach extender measures 17 3/4" L x 6 1/2" W x 6 1/4" H.
Everytime you think you have lock this pick up tool it comes a lose very difficult for me it doesn't need to have all the so call useful things attached to the item I hate it doesn't use it much. It's a square aluminum tube with a twisted-strand steel(like) cable running thru. The gripper ends are hard suction cups. They appear to be sturdily attached, however, they angle an outward V so if you pick up anything round, you'll need to put the item more inwards, bypassing the suction cups, else the item will just slip out of grip. It's a trigger grip. Once you begin to squeeze, the trigger does not release. So you can maintain pressure without having to continue to grip the trigger. This *could* have been useful, but it's extremely difficult to release tension at all, and it would take both hands to do so. On the handle there's an open rectangle. On the left side the word OFF is printed, and on the right is ON. It looks like there should be a larger slider 'button' there, but mine did not have one. However, to release tension, you have to squeeze the trigger tighter, and push that painful little stem UPwards. It absolutely will not move left/right. Don't ask me. The box was taped so sloppily, I could just stick my hand in and pull this thing out. It was a box much too large for the gripper, and it banged around in there despite paper wadding, so maybe the slider fell out. Since the wand bends for easy storage, the steel cable will eventually stretch out too much to be useful. It could last a long while, or maybe not. Given the shoddy overall construction, I'm not putting any bets on it. Very not happy with this thing, and the fact that it's too cheap to bother mailing back so I'm stuck with a waste of money. See notes above. Pads wouldn't stay screwed on. Middle joint broke easily. Ended up with duck tape all over it. I finally just bought a new one a couple weeks ago and tried to pick up my weekend paper which snapped the middle joint in two. Won't ever buy again. poor quality, light weight, locking mechanism to keep straight won't stay closed folds in half when you try to pickup object. suction cups lock each time and won't release. Inexpensively made but does the job. Especially like the locking feature. My brother cannot pick up things so he chose this. I need help reaching items from the floor and shelves. I'm not a tall person. Can't reach items in cabinets. I'm in wheelchair 24/7 but still able to do somethings and need a little help. Had this type originally years ago and haven't seen them so have other types but like this one best. So my husband can take it with him in his power chair. To take to the market when I am shopping. I have trouble with my shoulders and cannot reach very high. With this I can get and return glasses to a top shelf. Need one in every room..
similar to the one I received from physical therapy last year.It has held up and works well. to help me reach things idrop on the floor and reach on to a high shelf because I can 't use a step ladder any more I am 86 years young. I don't have good balance, so it would be easier to pick things up. Not a problem, so easy to order. I needed one. This one is not very good for heavier items but for what I mostly need it for it works. I think next time I will order a solid not folding one. I have had the picker up tool before and loved it. I carry one around with me it such a great help for picking up paper,water bottles, items of clothing, just about anything that has fallen. I have one in the kitchen & bathroom because it is wonderful for a person who can not stoop down. To reach items that I couldn't get to otherwise. Had one before but not foldable and different versions do not work as well! I have Muscular Dystrophy and can't reach many items on shelves at home and stores. Having it fold makes it easier to bring with me away from home. It helps get items you can't ordinarily reach. I use a walker and have a non folding grabber at home. The grabber assists me when I drop things as I have vertigo and falling creates a big problem that requires 3 firemen to get me back on my feet. 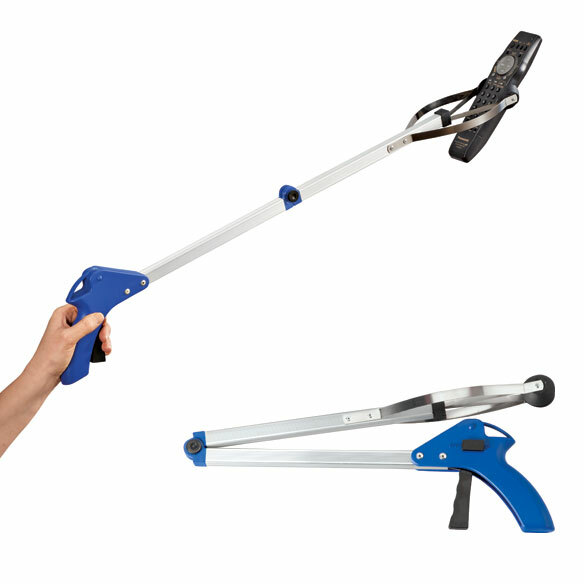 A folding grabber will be of major assistance to me when I am out and about! I'm looking for steel/wooden bed brackets to support the bed mattress #311640 Are they still available??? would it get clothes out of the washer ? Are tips replaceable, and available? BEST ANSWER: Thank you for your question. No, the tips are not replaceable. We hope this information will be of help to you.